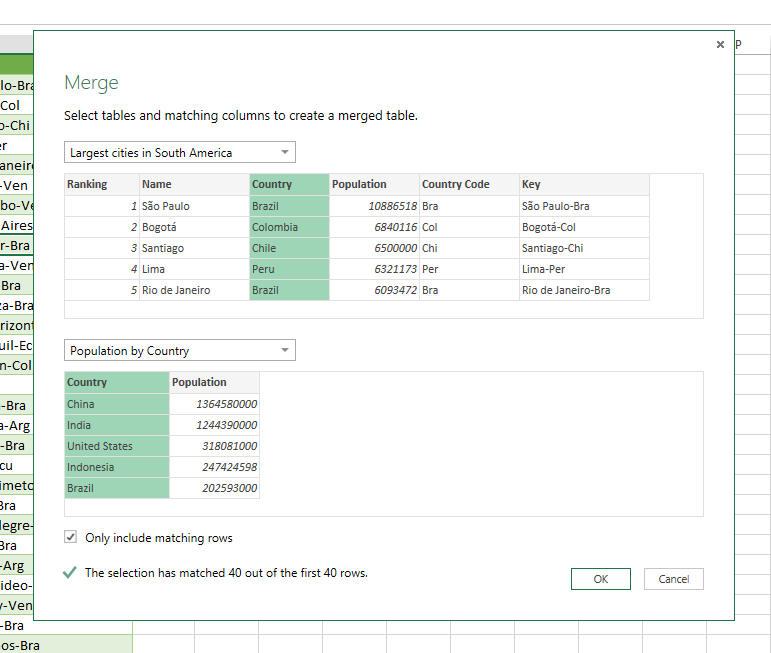 Welcome back to our Getting Started with Excel and Power BI series. 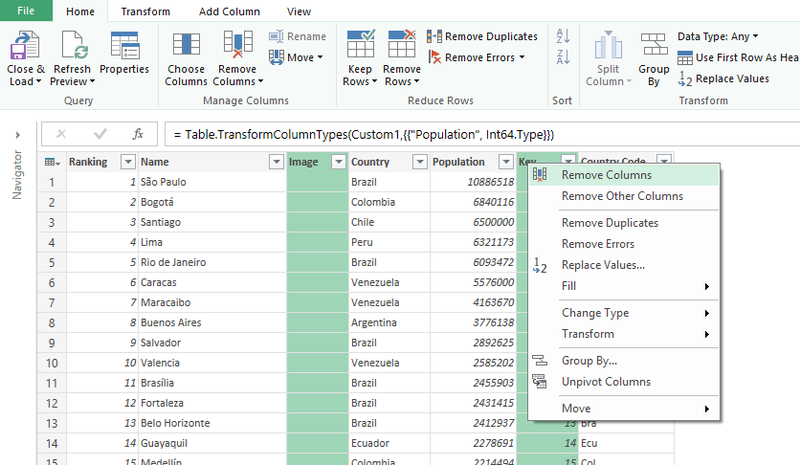 Today we will continue with our first Excel feature, Power Query, which allows you to discover, shape and transform your data before importing it into Excel or your Power Pivot data model. 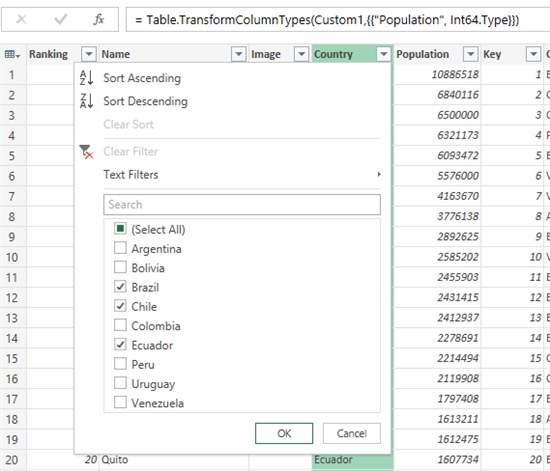 In Part I we covered mostly how to connect to different data sources and some quick transformations for your newly found data. OK, let’s get started. Open the provided Excel file at the end of this post. You can follow the getting started steps with the video or with the text on this post. 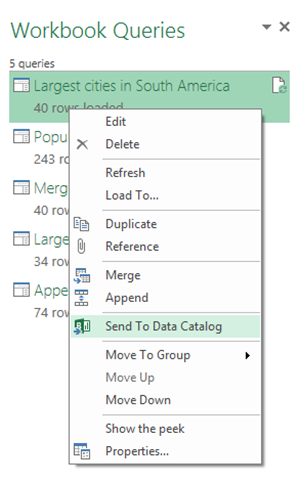 Once you open the file, select Power Query from the ribbon. If you are on one of the imported tables, you will see the Workbook Queries menu on your right. 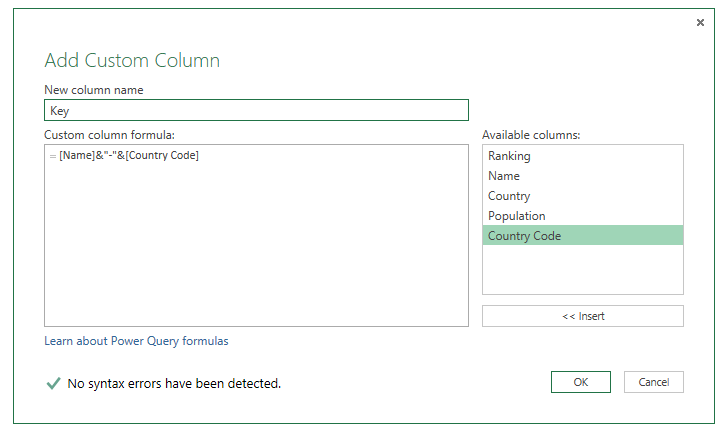 If you don’t, just click the Workbook Queries button on the Power Query ribbon. 1. First, let’s try automatic filtering. 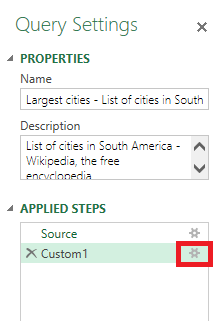 Select the Country column, click on the down arrow, deselect (Select All) and choose Brazil, Chile and Ecuador. 2. 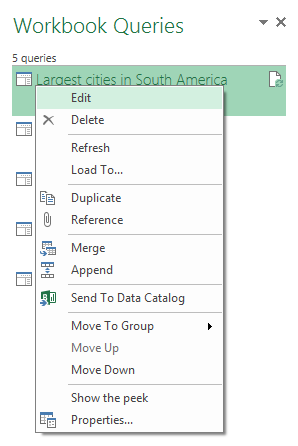 When you click OK, you’ll have the filtered list. 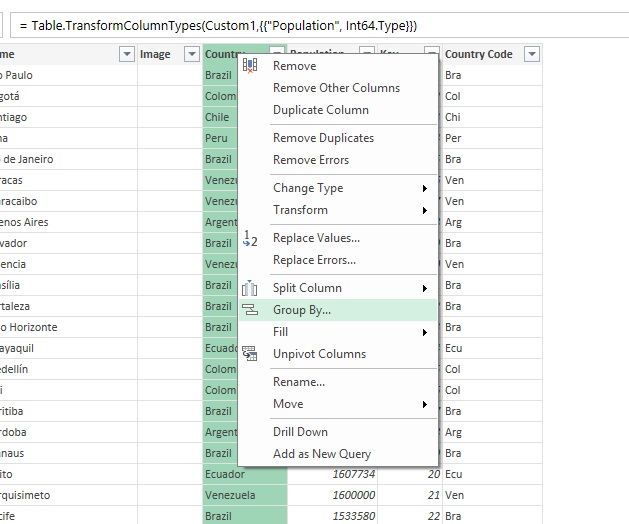 You can also use the same menu to sort your data (ascending or descending). You can perform almost any type of operation with columns on the Query Editor to shape and transform your data any way you like it. We did that on step 1 with a simple formula. 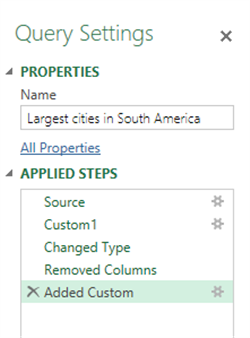 Let’s try other transformations available within Power Query. 2. Now, let’s create a Key with our country code and the city name. 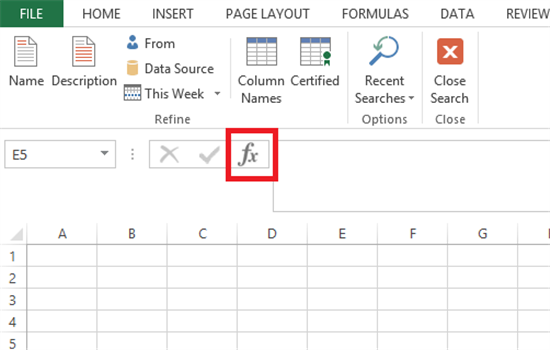 In Excel, this would be a text operation with the “&” symbol. 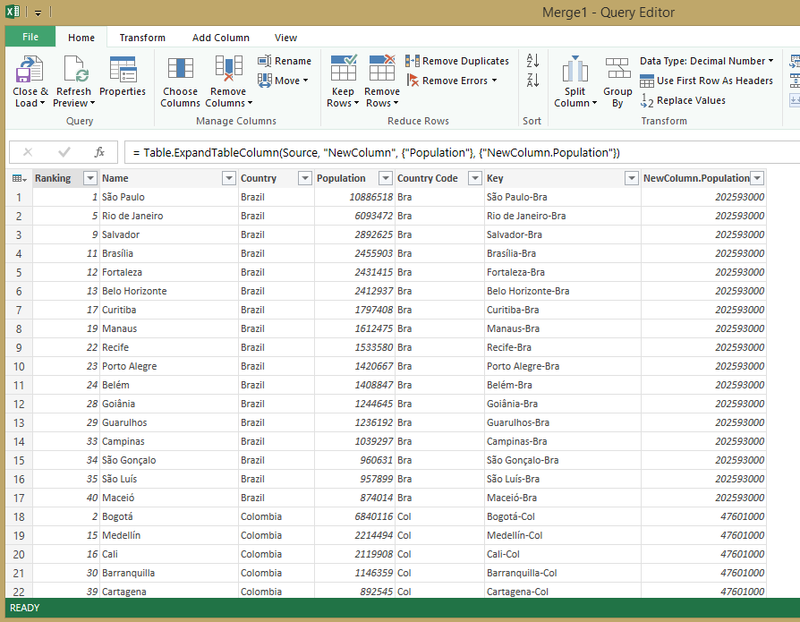 In Power Query, this is the same. Click on add custom column on the column menu. 4. 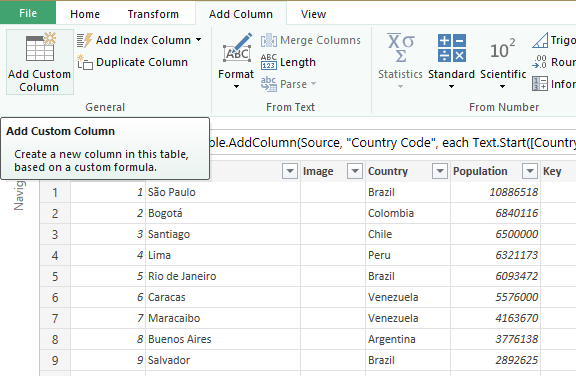 You will see the newly added column after you click OK and the function being showed in the formula bar. The Power Query Formula Language provides a lot of flexibility to shape and transform your data. You can find more information and references here. 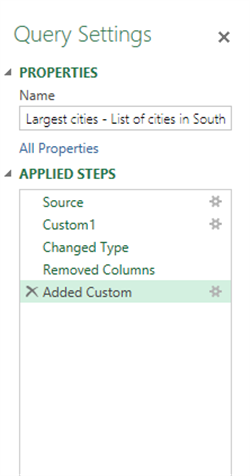 In any case, you can use the Query Editor to save these steps through the UI and Power Query will take care of the formulas for you. 1. 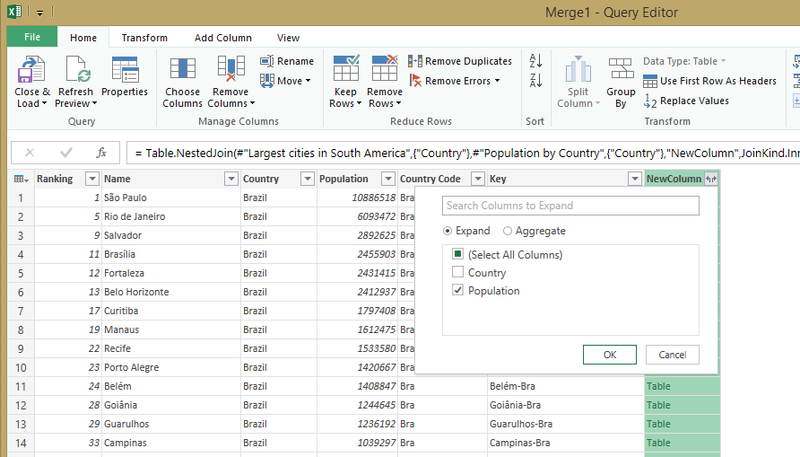 First, we will merge this query with another one that has the country population on it. 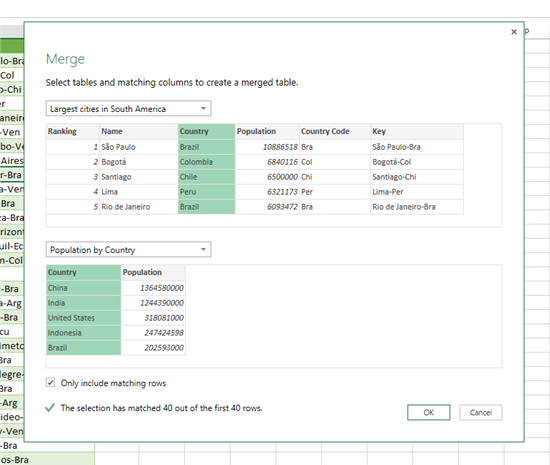 The file provided already has another query (found with Online Search) with the population of countries called “Population by Country”. 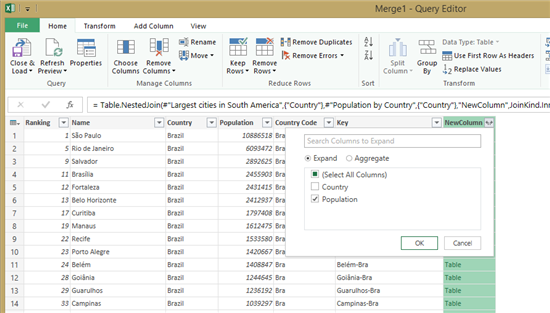 Click on the Merge button on the Power Query menu. 3. 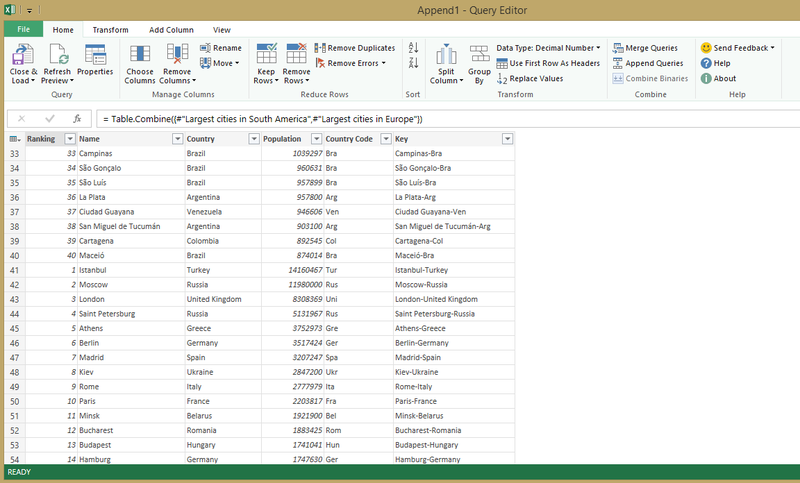 You will get a new Query Editor window with a new column. Click on the corner of the header for this new column and select the fields that you want to merge. 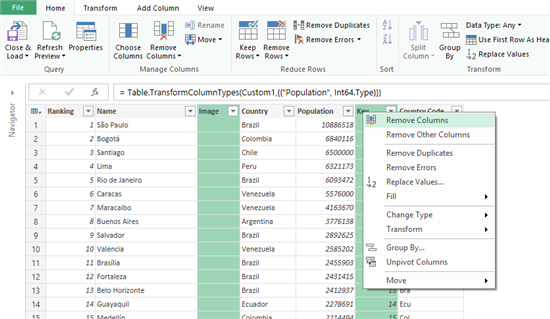 In this case, we want population. 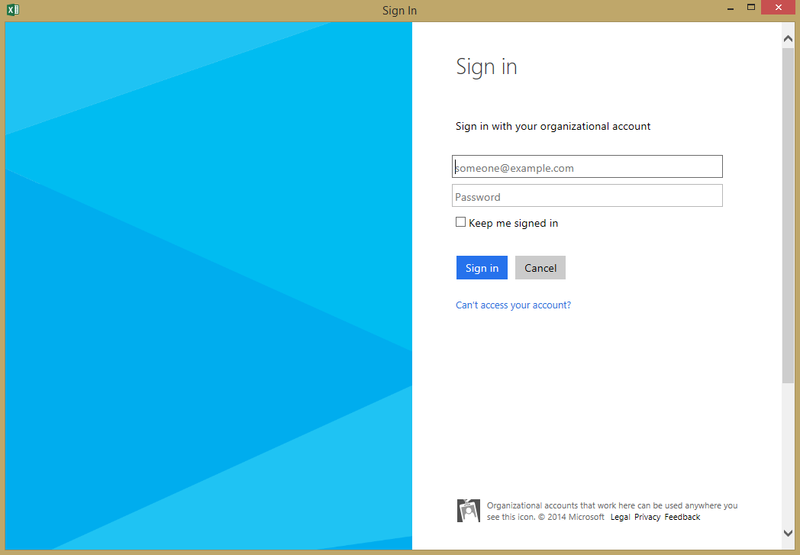 Then click OK.
4. Now, we have a new table with all the information we had before, plus the population of the country for each record. If we click on close and load, we’ll import this data into Excel. 5. 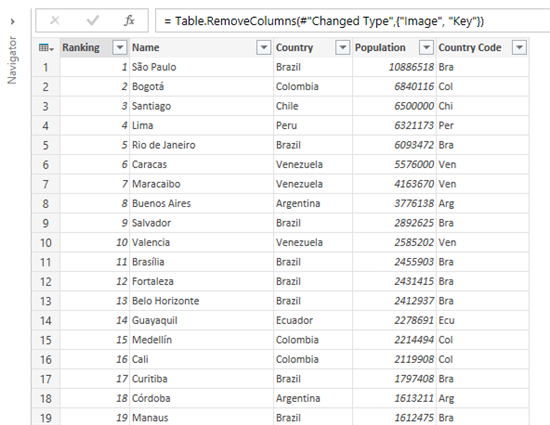 Now, let’s try to append data to our original table. 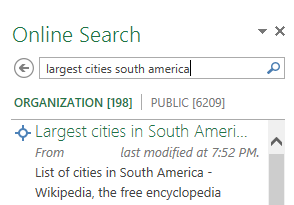 There’s another query in the file called “Largest Cities in Europe”. 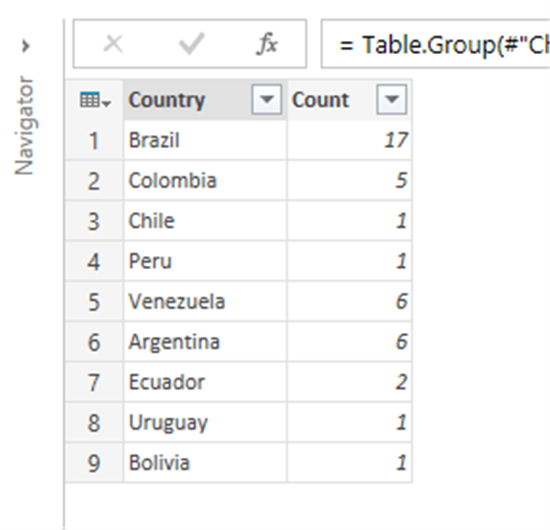 This query already has the same structure as our original table after adding Country Code and Key, including column names. 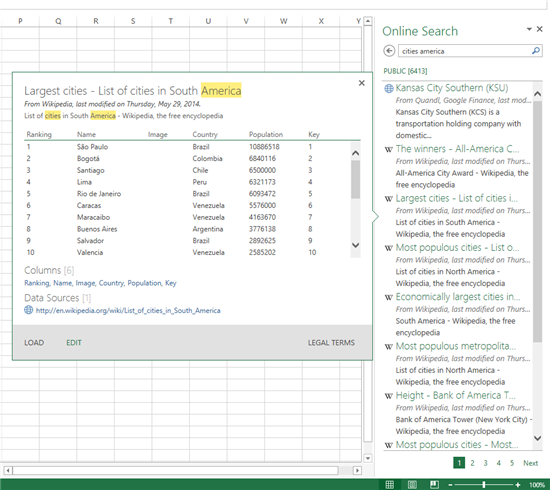 We achieved this using the Query Editor on a similar online search. You can review the steps editing this provided query. 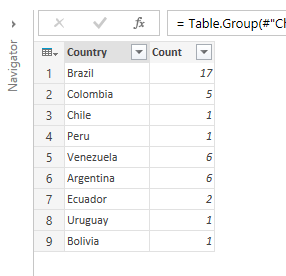 We’ll append this data to our first table. 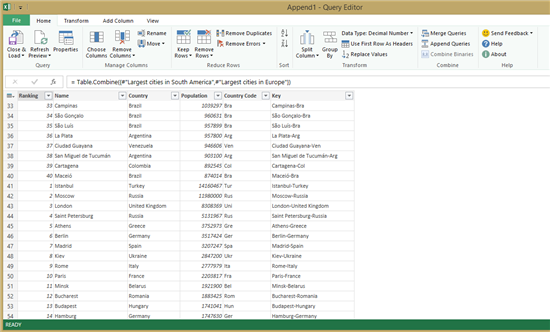 Click on the Append button on the Power Query menu. 6. As before, select the 2 queries that we want to Append (“Largest Cities in South America” and “Largest Cities in Europe”) and then click OK.
7. 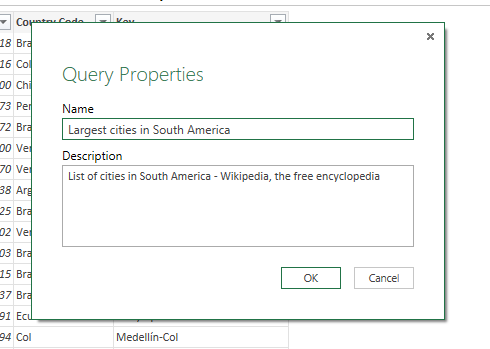 You will get a new Query Editor window with the appended queries. 6. You will get another opportunity to edit the name and description. 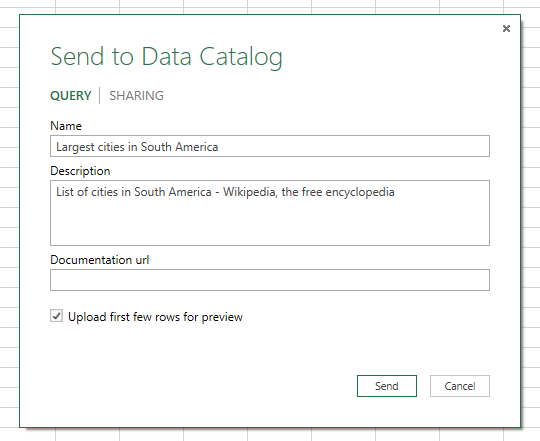 You can also add a documentation URL in case people want more info or request access to the data. 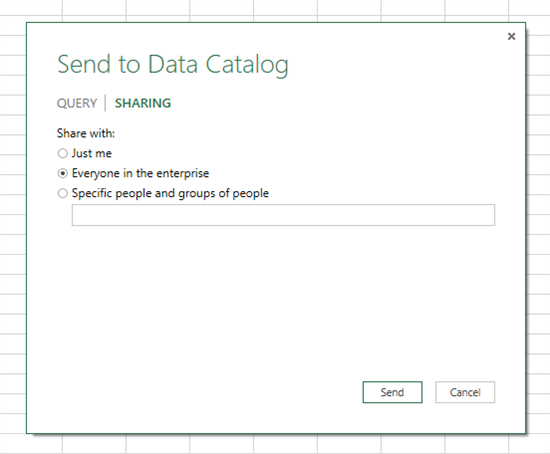 Click on the Sharing menu. 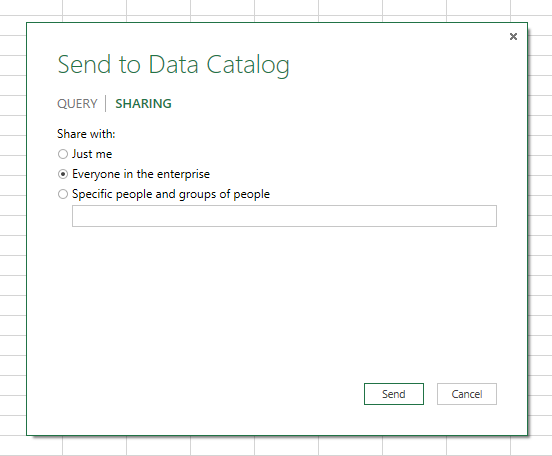 Here you can decide who will have access to query you’re sharing. In this case we will go with Everyone in the enterprise. Click Send. 7. 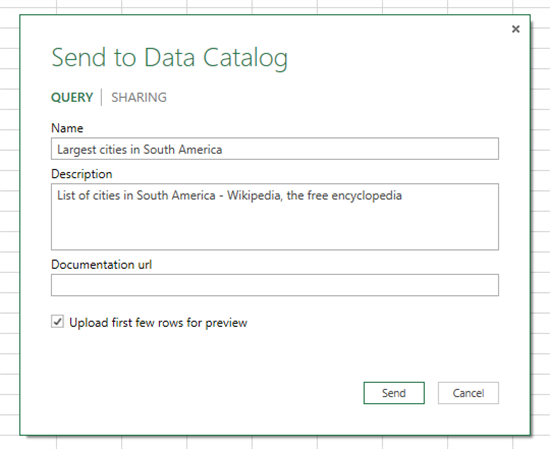 Now, your query is live on the Data Catalog and discoverable by anyone based on your description. 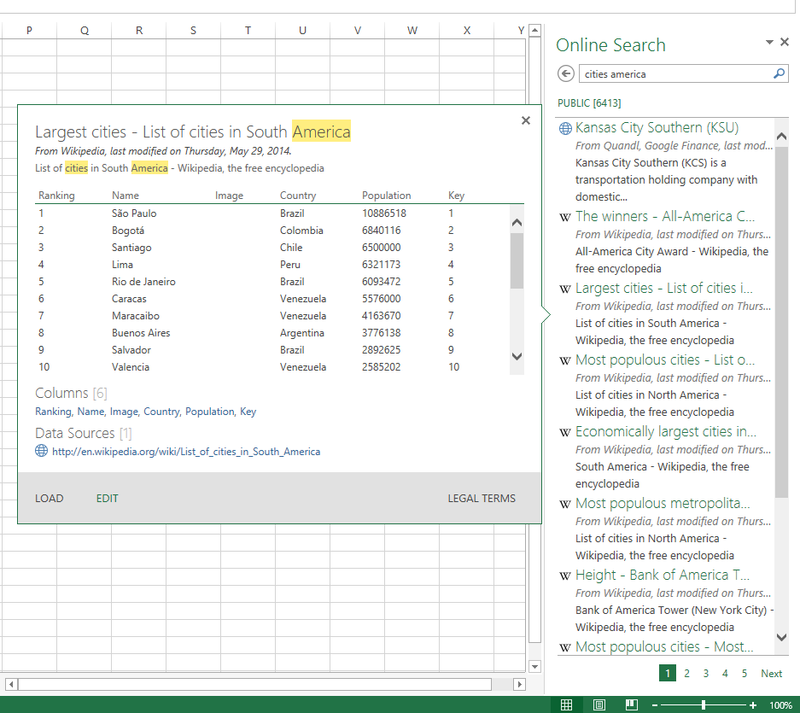 Let’s do an online search for it and filter by organizational data. 8. 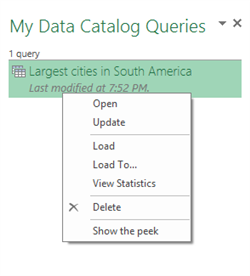 Finally, if you want to edit your shared queries you can click on the My Data Catalog Queries button on the Power Query ribbon. From this menu you can delete, load, update and even view statistics for your query.